We have all read the headlines after an inspection takes place – it can make for grim reading. And whereas we should all welcome the transparency involved in inspections and the public reporting of findings – the headlines do not tell the whole story. There are many ways Healthcare improvement Scotland support improvements in care delivery and inspection is one way that is greatly valued – both by the public and by care providers. However inspections are not done for the purpose of making headlines or creating media articles – although we welcome their interest in our work. They are always conducted with patients and the public front of mind with a view to making improvements in the care they receive. For example, we have been inspecting the safety and cleanliness of Scotland’s hospitals since 2009. The starting point has always been that patients and the public deserve to have complete confidence in the safety and cleanliness of our hospitals. We know that people want to be assured that their local hospital is clean, hygienic and they are not at risk of getting an infection. Since 2009 we have conducted 273 safety and cleanliness inspections – a mixture of announced and unannounced visits. During that time we have identified a huge amount of good practice which helps reduce infection risk to patients and the public. However, we have also identified areas where further improvements were required by NHS boards. If we take an overview of hospital infections over the last nine years, the picture is one of significant improvement. Recent figures from Scottish Government show that, since 2007, cases of MRSA have reduced by 87% and cases of Clostridium difficile infection in patients aged 65 years and over have fallen by 86% – the lowest on record. We feel confident that inspections have played a strong supporting role in NHSScotland reducing those incidents of infection. One indicator which supports this is the significant decline in the number of requirements and recommendations arising from inspections since they began (see Figure 1). Overall, we have seen a 48% reduction in the average number of requirements arising from each inspection since the inspections began in 2009. We have also seen a corresponding 81% reduction in the average number of recommendations made in each inspection over the same time period. The impact of the inspections in safety and cleanliness give us confidence that inspection is a valuable tool – used at the right place and at the right time. And although this is hugely important to providers and the public alike, it is only one aspect of improving health and social care services. So we have consulted with colleagues in healthcare, other key partners and agencies, and we are now taking a broader look at how we design and deploy our inspections and reviews. Out of those consultations we are now looking at a Quality of Care Approach: a methodology which firstly, will help providers to understand their own strengths and challenges and to plan for improvement. 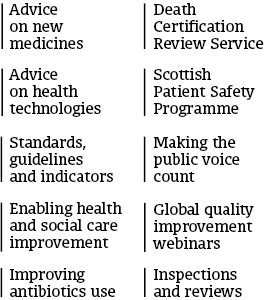 Healthcare Improvement Scotland will then support providers to deliver those improvements through either direct input (for example inspections and reviews), pointing to good practice elsewhere, or through the provision of support materials and guidelines. As I mentioned earlier in this article, our organisation is one of many parts all pulling towards the same purpose – making care better. The Quality of Care Approach will enable us to bring in a wider suite of support to help and support providers improve their services. But we will still target and harness the benefits of inspections in the right place at the right time to improve the care people receive across Scotland. Alastair Delaney is Director of Quality Assurance at Healthcare Improvement Scotland.